Let’s see some action Rory. Just do it! 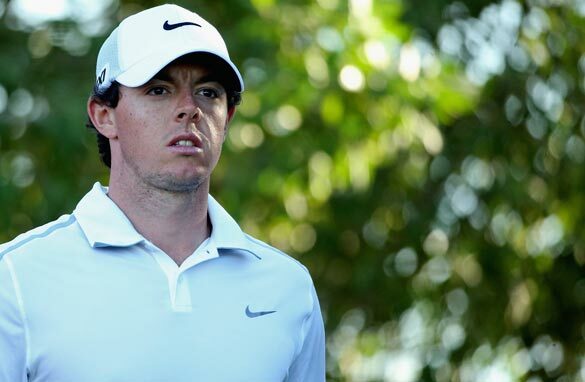 McIlroy is now Tiger Woods' stablemate at Nike. Actions speak louder than words. So for Rory McIlroy, a missed cut in Abu Dhabi in his opening event of the 2013 season was far from ideal. The world No.1 was the talk of the sports world at the beginning of the week as Nike Golf announced his arrival as their newest and most significant signing. He is believed to have signed one of the biggest sponsorship deals in sports history with figures of $200 million over five years being suggested. At the heavily stage-managed launch by Nike, McIlory confirmed he was making a wholesale change to Nike products throughout the bag. After an eight-week break since he closed out the 2012 season in stunning style up the road in Dubai, the plan for the new year was all about change. He would be playing a driver, fairway woods, irons, putter and ball, all made by Nike. Except that by Friday at the Abu Dhabi HSBC Golf Championship he had reverted back to his old Titleist Scotty Cameron putter for the second round. It’s a new phase in McIlroy’s life and career. An established professional of five seasons, with so many expectations realized and so much hype justified, the two-time major champion and undisputed world No.1 was ready to move to a new level. Part of this was his long-held dream to become a sporting brand ambassador on a par with the likes of his heroes Tiger Woods, tennis stars Roger Federer and Rafael Nadal and footballer Wayne Rooney of McIlroy's beloved Manchester United. With the Nike deal signed and no more logos or brands on public display other than the “Swoosh”, McIlroy is in the perfect position to focus all of his attention on his true goals, those of winning major titles and in the short term, gearing up for the Masters at Augusta and the realistic ambition of winning his first green jacket. No longer does he play for money, he has riches beyond his wildest dreams and he’s only 23. All that he lacks are air miles in the competitive sense with his new equipment. By the sound of it McIlroy’s off-season was far from relaxing. High altitude training and some downtime in Colorado with his girlfriend, the tennis player Caroline Wozniacki was followed by trips with her on the tennis circuit to South America. After a few relaxing days celebrating Christmas at his new home with his parents and the Wozniacki family, he was quickly into some club testing with the Nike gurus at the Bear’s Club in Palm Beach near his Florida home, before flying to Australia to support his girlfriend as she warmed up for the Australian Open. He returned to Dubai where he began an intensive week-long series of club fitting and testing at the Els Club before driving to Abu Dhabi for a busy few days of hype regarding his launch as the new face of Nike Golf and another distracting day of speculation over the election of a new Ryder Cup captain. One in which he became very much caught up in as a major supporter of Paul McGinley. McIlory's very public show of support and outward displays of a conviction regarding how the captaincy issue should be dealt with, gave us a glimpse into the strength of mind which he possesses. He will be smarting at his poor display and missed cut at Abu Dhabi. With four weeks until his next appearance in Arizona at the Accenture World Match Play, we should expect to see a more commanding performance from McIlroy as he truly begins his build-up to Augusta. This performance was far from perfect and not what Nike will have desired, but at the end of the day there’s only one man that matters and he will be ready to continue his march towards his sporting destiny. The time for talking is over. Let’s see some action Rory. Just do it.